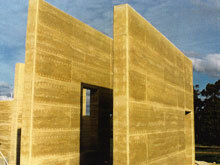 What is Stabilised Rammed Earth? 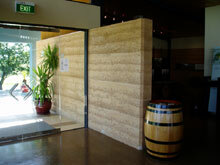 Stabilised Rammed Earth is an environmentally friendly masonry wall material that looks and lasts like cut stone. It is made from natural sub-soil or crushed stone, mixed with a small amount of stabiliser and dynamically compacted in removable shuttering. When the formwork is removed, the stabilised rammed earth walls are revealed complete with accurate spaces for windows, doorways, etc. already pre-formed. 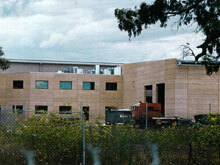 Stabilised Rammed Earth is strong, weatherproof and maintenance free. It can demonstrate compliance with UK Building Regulations for insulation, strength, water resistance, fire and acoustics. In natural colours and with a distinctive layered pattern, this new form of masonry appeals to modern architectural forms. It will not fade or deteriorate and needs no protective coatings or maintenance. As it is unfired, it has low embodied energy and is fully recyclable. Stabilised Rammed Earth is a modern practical method for green sustainable building – and it works!